A growing body of research on the human brain proves that, for better or worse, leaders’ moods affect the emotions of the people around them. The reason for that lies in what scientists call the open-loop nature of the brain’s limbic system – our emotional center. A closed-loop system is self-regulating, whereas an open-loop system depends on external sources to manage itself. In other words, we rely on connections with other people to determine our moods. The open-loop limbic system was a winning design in evolution because it let people come to one another’s emotional rescue – enabling a mother, for example, to soothe her crying infant. The open-loop design serves the same purpose today as it did thousands of years ago. Research in intensive care units has shown, for example, that the comforting presence of another person not only lowers the patient’s blood pressure but also slows the secretion of fatty acids that block arteries. Another study found that three or more incidents of intense stress within a year (for example, serious financial trouble, being fired, or a divorce) triples the death rate in socially isolated middle-aged men, but it has no impact on the death rate of men with many close relationships. Scientists describe the open-loop as “interpersonal limbic regulation”; one person transmits signals that can alter hormone levels, cardiovascular functions, sleep rhythms, even immune functions, inside the body of another. That’s how couples are able to trigger surges of oxytocin in each other’s brains, creating a pleasant, affectionate feeling. But in all aspects of social life, our physiologies intermingle. Our limbic system’s open-loop design lets other people change our very physiology and hence, our emotions. Even though the open-loop is so much a part of our lives, we usually don’t notice the process. Scientists have captured the attunement of emotions in the laboratory by measuring the physiology – such as heart rate – of two people sharing a good conversation. As the interaction begins, their bodies operate at different rhythms. But after 15 minutes, the physiological profiles of their bodies look remarkably similar. Researchers have seen again and again how emotions spread irresistibly in this way whenever people are near one another. As far back as 1981, psychologists Howard Friedman and Ronald Riggio found that even completely nonverbal expressiveness can affect other people. For example, when three strangers sit facing one other in silence for a minute or two, the most emotionally expressive of the three transmits his or her mood to the other two – without a single word being spoken. The same holds true in the office, boardroom, or shop floor; group members inevitably “catch” feelings from one another. In 2000, Caroline Bartel at New York University and Richard Saavedra at the University of Michigan found that in 70 work teams across diverse industries, people in meetings together ended up sharing moods – both good and bad – within two hours. One study asked teams of nurses and accountants to monitor their moods over weeks; researchers discovered that their emotions tracked together, and they were largely independent of each team’s shared hassles. Groups, therefore, like individuals, ride emotional rollercoasters, sharing everything from jealousy to angst to euphoria. A good mood, incidentally, spreads most swiftly by the judicious use of humor. Daniel Goleman’s new book FOCUS: The Hidden Driver of Excellence and CD Cultivating Focus: Techniques for Excellence are now available. 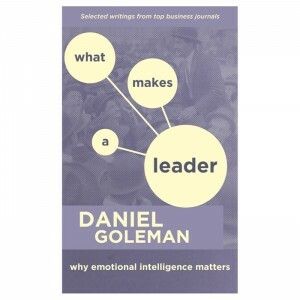 His more recent books are The Brain and Emotional Intelligence: New Insights and Leadership: The Power of Emotional Intelligence – Selected Writings (More Than Sound). Leadership: A Master Class is Goleman’s comprehensive video series that examines the best practices of top-performing executives.